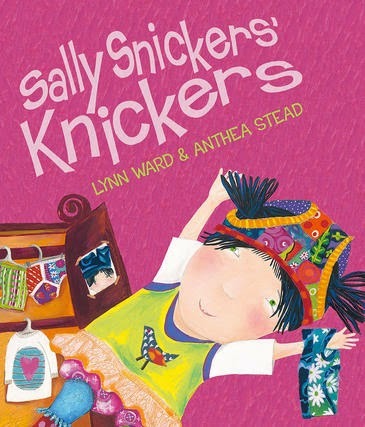 Sally Snicker’s Knickers is a children’s picture book written by Lynn Ward, illustrated by Anthea Stead, and published by Walker Books Australia, 2014. I’ve previously reviewed Ward’s The Big Beet. There's something very special about little Sally Snickers, for Sally never wears a hat, she'd rather wear her knickers! Perfectly pitched at early primary. Introduces concepts of going to school, friendship, being different and belonging in an engaging way. Sally doesn’t just love undies, jocks and knickers, she actually wears her knickers on her head to school. And that’s where the problem begins. Her teacher is not happy with her headgear, and tells her she can’t play unless she wears a hat. Sally loves being different, and is downhearted - until she arrives at school next day to see all the kids wearing undies on their head in support. Kids will love the vibrantly colourful illustrations. Stead really has contributed to the exuberance and fun with gorgeously detailed and different knickers, as well as unusual perspectives. My favourite double-page spread is the final one of the bespectacled and blue-permed teacher wearing a lacy thong on her head - while the knicker-hatted kids peer all a-giggle through the doorway! This is a light-hearted romp that kids will enjoy. I would suggest it makes a fine resource for Sun Safety - because kids will of course understand this IS a joke, and that wearing a hat in the sun rather than knickers makes plain good sense. I picture classes having fun with a Sally Snicker Knicker Day, and teachers joining in too - another glorious way to celebrate the fun that picture books can bring! I’ll be adding Sally Snicker’s Knickers to A List of Children’s Picture Books with Strong Rhyme and Rhythm.